Stocks in the US finished last week mostly lower as investors braced for impact from Hurricane Irma in Florida and eyed a renewed missile threat from North Korea. The S&P 500 booked a weekly loss of 0.58%, with nine of its 11 sectors trading in negative territory on Friday alone. Dow Jones Industrial Average futures declined 0.86% for the week. Trailing behind the pack was the Nasdaq 100, which closed 1.29% lower for the week. Despite slowly declining stock prices, the real talk of Wall Street was the continuing weakness in the US dollar. The US Dollar Index, which measures the greenback against a basket of 6 rival currencies, closed 1.54% lower for the week. This stout weekly loss brings the US dollar’s 3-month performance to -5.53% and its 6-month performance to -10.36%, putting it in correction territory. During Friday’s trading session, the US Dollar Index briefly touched 91.06, which put it on track for the largest weekly decline since May 19, according to data compiled by Factset. Generally speaking, a weak US dollar is a direct benefit to commodities that are primarily traded in US dollars, because US dollar denominated commodities become cheaper to purchase for foreign investors. The extremely weak US dollar certainly aided gold last week, as gold soared to $1,362.40 per troy ounce during Friday’s trading; a level not seen in two years. Similarly, spot silver traded above $18.10 per ounce for the first time in seventeen weeks, marking its third consecutive weekly gain. Analysts noted last week that a strong rally in precious metals is not unusual amid lingering North Korean missile tensions and a string of unprecedented natural disasters in the US. “Risk aversion is creeping back into the markets on Friday as traders prepare for what could be another troubling weekend in the continuing standoff between the U.S. and North Korea,” said Craig Erlam, senior market analyst at Oanda Corporation, a foreign exchange data company. 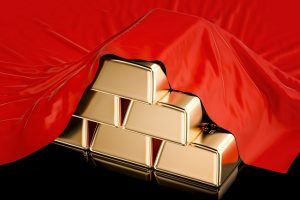 When looking at the market from a macro perspective, the US dollar is in free fall, North Korea is still loosely threatening to launch nuclear warheads, the stock market has lost most of its momentum, and gold is absolutely soaring. Moreover, as earnings season is officially over, there seems to be a lack of fundamental bullish market events that have the possibility of pushing the market higher in the next couple of months. With this said, all of the ingredients seem to be present for a big spike in precious metals. Natural disasters, potential nuclear war, a flat stock market running on fumes, and Washington in political deadlock are all significant factors to market participants around the world. Additionally, gold analysts noted last week that many institutional investors are not heavily invested in risk-averse assets. “Wall Street is heavily under invested in precious metals, and even a little bit of capital flowing into these markets can spark a much larger price run,” said Peter Spina, president and CEO of precious-metals data firm Gold Seek. This is truly fantastic news to gold bulls, because institutional investors on the Street arguably have the most influence on market prices. And if even one of the current issues facing the market takes a turn for the worse, an institutional flight to safety could easily send gold soaring even more than it already has.